FUTURO(R) STABILIZING KNEE SUPPORT Provides support to weak and sore muscles above and below the knee. Also permits movement without slipping or rolling. FUTURO(R) MOISTURE CONTROL KNEE SUPPORT Provides support to stiff, weak or injured knees. A unique combination of neoprene-blend and Polartec® Power Stretch-RX® materials helps keep the ankle warm and limber while releasing excess heat and moisture. FUTURO(R) COMFORT LIFT KNEE SUPPORT Provides support to stiff, weak or injured knees. Wear during activities which lead to discomfort. FUTURO(R) WRAP AROUND ANKLE SUPPORT Offers firm support to help relieve pain due to ankle sprains, chronic ankle instability and over use syndromes.For left or right ankle, measure around ankle, just above the bone. FUTURO(R) COMFORT LIFT ANKLE SUPPORT Soft binding around heel opening for additional comfort. Designed for all-day comfort. For left or right foot, measure around the heel and the instep. 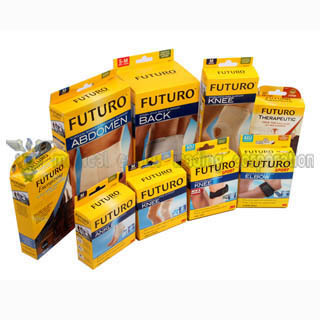 FUTURO(R) SPORT DELUXE ANKLE STABILIZER Provides strength, protection and rigid support to stiff, weak or injured ankles. 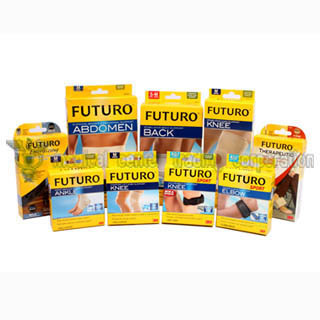 FUTURO(R) SPORT ADJUSTABLE ANKLE SUPPORT Provides strength and support for stiff, weak or injured ankles. Also helps provide protection from further injury. FUTURO(R) REVERSIBLE SPLINT WRIST BRACE, BLACK Provides comfortable, firm support and protection for injured, weak, or post-cast wrists. FUTURO(R) WRAP AROUND WRIST SUPPORT, BEIGE Provides support to stiff, weak or injured wrists. Wear during activities which lead to discomfort. FUTURO(R) SPORT ADJUSTABLE WRIST SUPPORT Provides strength and support for stiff, weak or injured wrists. Also helps provide protection from further injury. FUTURO(R) COMFORT LIFT ELBOW SUPPORT Provides support to stiff, weak or injured elbows. Wear during activities that lead to discomfort. FUTURO(R) SPORT TENNIS ELBOW SUPPORT Provides relief from general pain and tenderness in the forearm and elbow caused by activities requiring a strong grip or active finger movement. FUTURO(R) SURGICAL BINDER AND ABDOMINAL SUPPORT Designed to support a sagging abdomen. Its use may also be recommended post-operatively by a doctor. 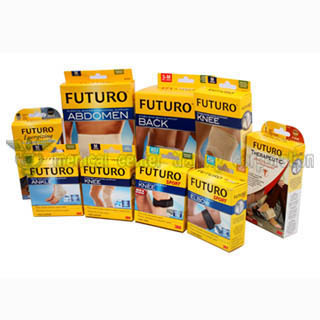 FUTURO(R) STABILIZING BACK SUPPORT Provides support to a stiff, strained or aching back. Use when support is needed for daily activities or exercise.Measure around the waist at the navel. Traditional trouser sizing does not apply.